On a soggy Sunday morning in Snowdonia, I took the opportunity to re-visit Andrei Tarkovsky’s 1979 cinematic masterpiece Stalker. It’s a film like no other – an immersive, meditative science fiction story that moves at such a glacial pace that, by the end of its two-and-a-half-hour running time, one is either mesmerised or bored to distraction. Far more spiritually infused than its literary source, Arkady and Boris Strugatsky’s Roadside Picnic (1971), Stalker takes you on a snail’s-paced journey into a post-apocalyptic world of mudane detritus, damp featureless landscapes and industrial ruination, all suffused with melancholic longing. By the afternoon, the Welsh rain had cleared and I drove up to Blanaeu Ffestiniog to explore the extraordinary landscape to the north of this slate mining town. 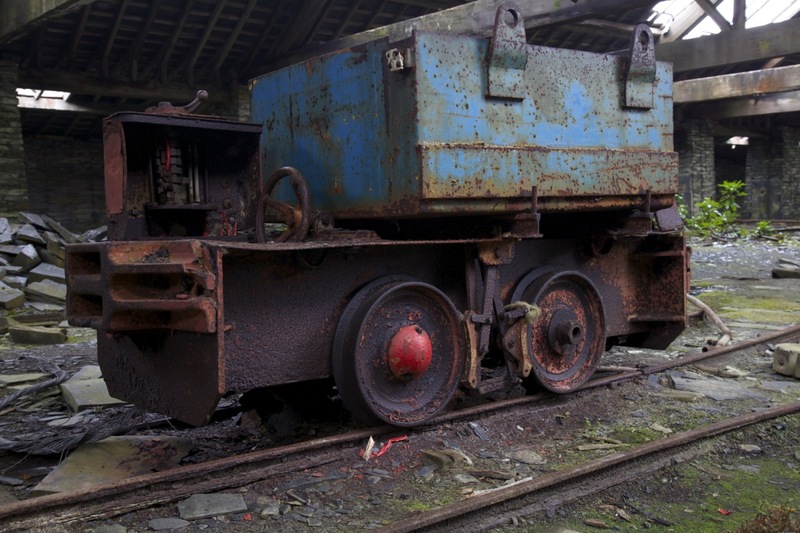 One of the wettest built-up areas in Britain, Blaenau Ffestiniog is surrounded by the remnants of a once global industry: groups of hills entirely made up of discarded slate and littered with ruined buildings and defunct machinery, and traversed by tramways at impossibly steep angles. 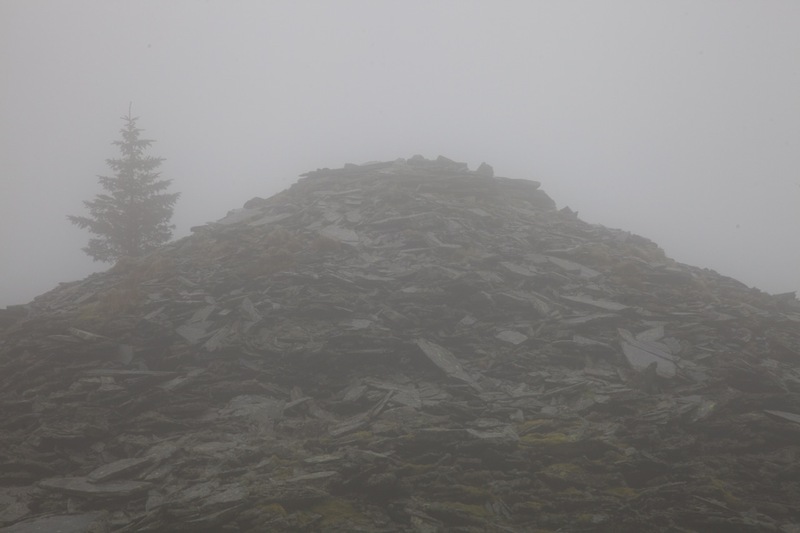 As I walked up one of these hills from the northern edge of the town into the Maenofferen quarry, the ruined landscape closed in, the encroaching mist above accentuating the enveloping quality of the slate hills (2). With Stalker so fresh in my mind, this landscape could not help but call to mind the Zone in that film and with that recollection, the hills became inscrutable, mysterious and distinctly threatening. 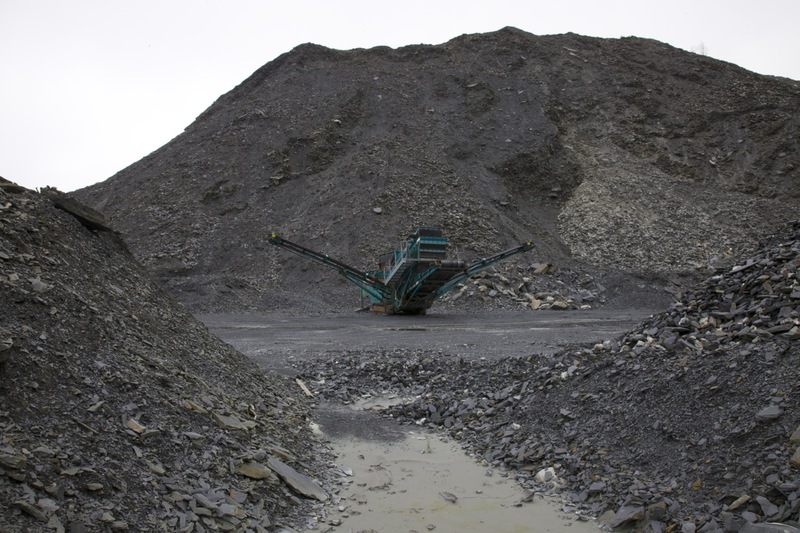 Some parts of the quarry are still worked: yet on this April sabbath, all of the machines stood idle, as if abandoned by an alien civilisation forced to leave in a hurry (3). Further up the slate-made hills, the mist descended like a benign miasma. As any hill-walker knows too well, mist is a peculiarly discomforting phenomenon. On the one hand, it makes everything so still, soft and muffled; on the other, it hides what is close by, collapsing the world into a small sensory bubble. 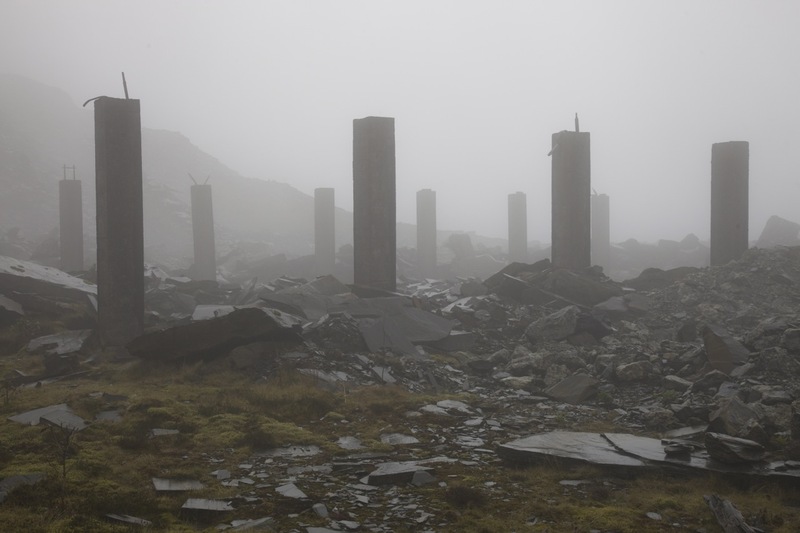 Here, just as in Stalker, the mist turned buildings into visual mysteries – half-shrouded entities that only made sense when close enough to make out their forms (4). Throughout my perambulation of this vast, unruly site, those mysteries seemed to deepen with every step, as if confirming the Zone’s profound illogic that the shortest way is never the most direct. So, only after a long detour around the edge of the Snowdonia National Park – navigating by fenceposts, half-glimpsed reservoirs and stream-beds – did I eventually return to the quarry from its northern side, finally entering the vast and monolithic buildings where the slate used to be unloaded and worked until the complex ceased production in 1999. 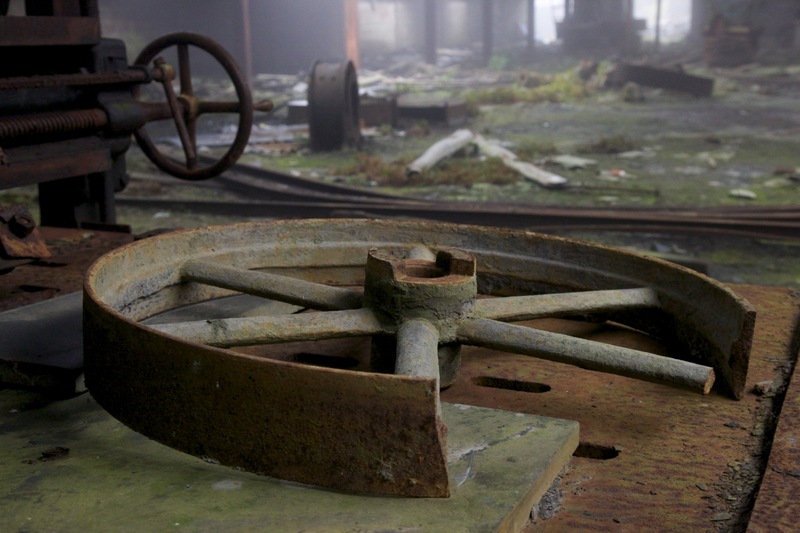 In these buildings – unlike many former industrial sites – all of the machinery and many of the tools have remained, seemingly abandoned with haste after some unknown cataclysm forced the workers to flee. 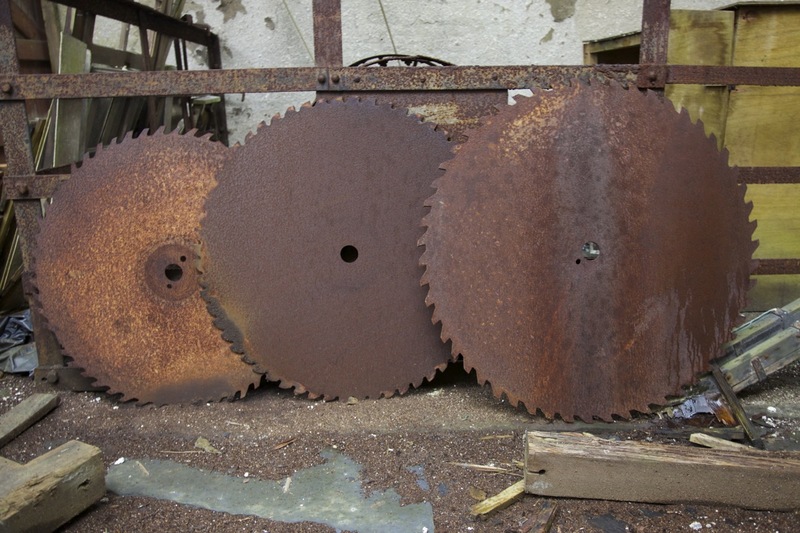 In these spaces, objects piled on objects, crowding in and demanding to be deciphered: three delicately-composed circular metal saw blades waiting to be catalogued (5); one gruesome hook longing for a kill (6); a lone rusting screw suggesting familial loss (7); one glove marking the position of a dead hand? 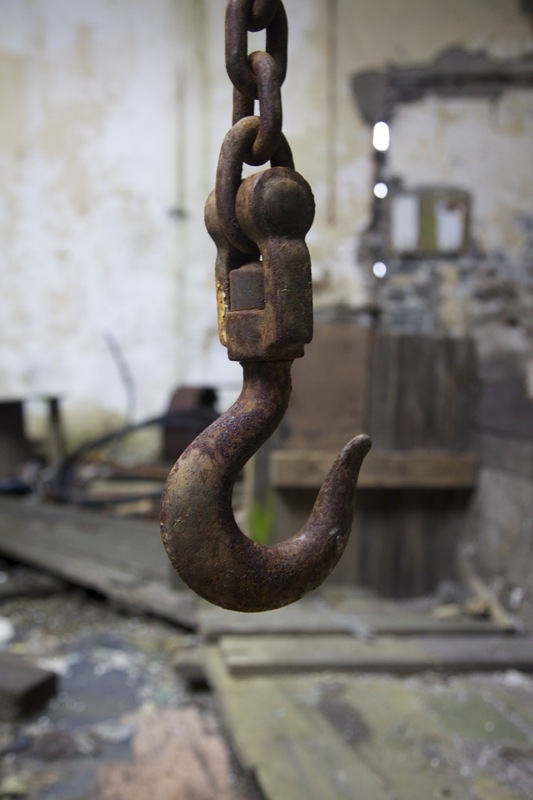 (8) Of course, with some basic knowledge of the slate-working process, I would have made sense of these objects, but who could have really understood the final room – a vast barn-like space filled with absurd vehicles petrified in immobility? 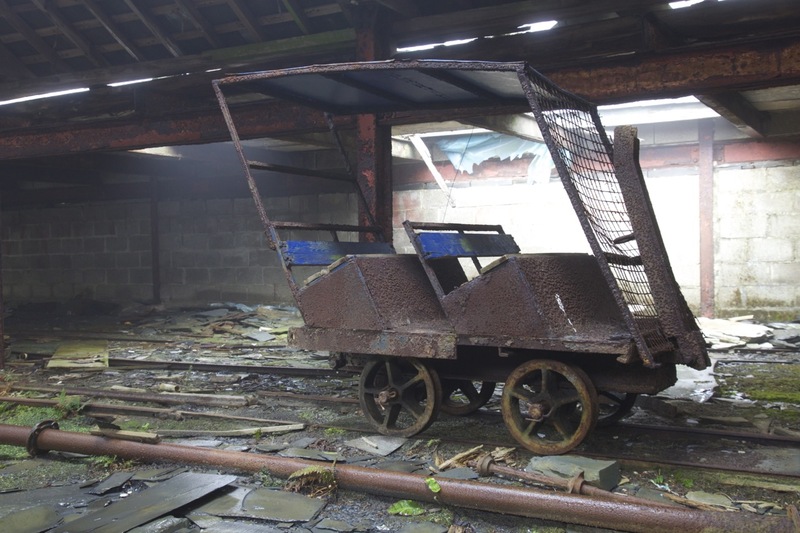 As the mist rolled in through the missing timber roof, these objects became extraordinary bearers of meaning trapped out-of-time: the green trolley ‘not allowed underground’ (9); the blue one with a single bright-red wheel hub (10); the strange sunken ‘eyes‘ of the yellow one (11); and the almost comedic shape of the rusty one (12). 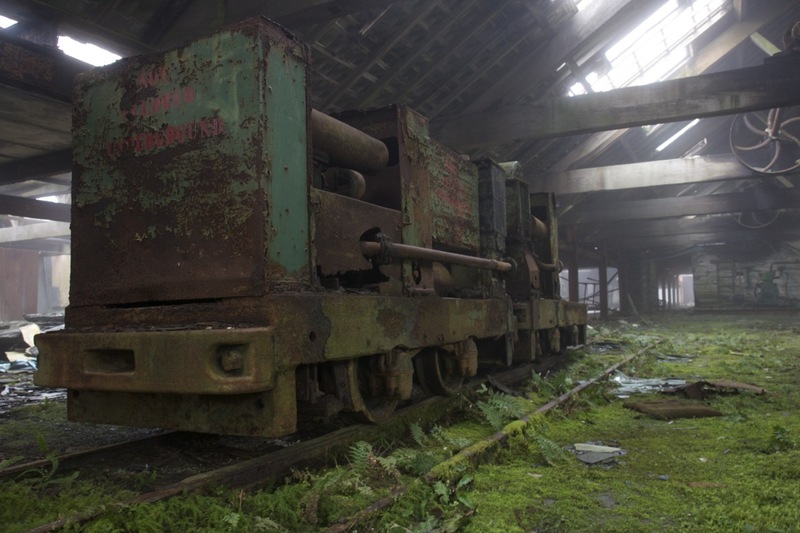 Yet, whilst photographing these vehicles, all of a sudden the mist vanished and the power of that mystery lifted. At once, these objects became more grounded and the alien monoliths outside the barn became what they really were: half-finished concrete pillars (4). Now, the Molewyn range of mountains appeared beyond and the real world opened up once again. Another great post, Paul. 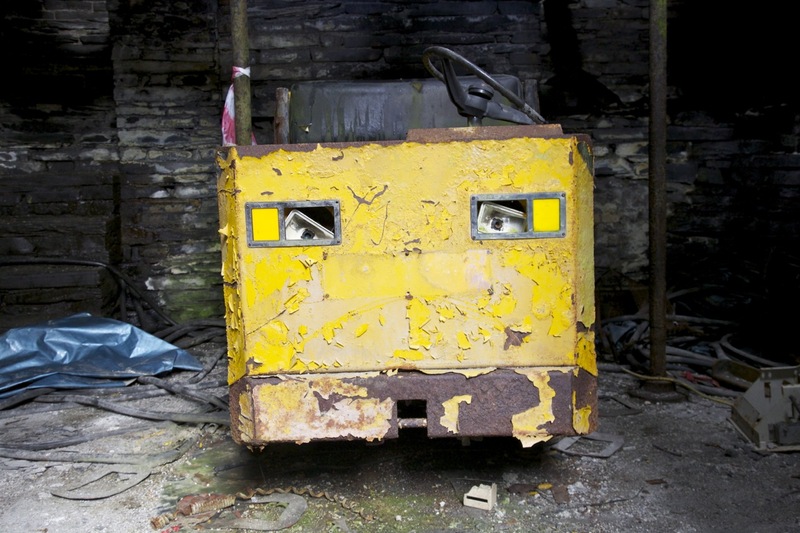 Beautiful photographs – and why are so many of us utterly seduced by post-industrial ruin / abandon? Does our fascination, like ‘Stalker’, suggest some kind of quasi-religious quest? Thanks Quintin – much appreciated. Discovered by accident really. Great post Paul. As if the watching of Stalker had called this landscape/Zone to you. Photograph no 4 particularly eerie. 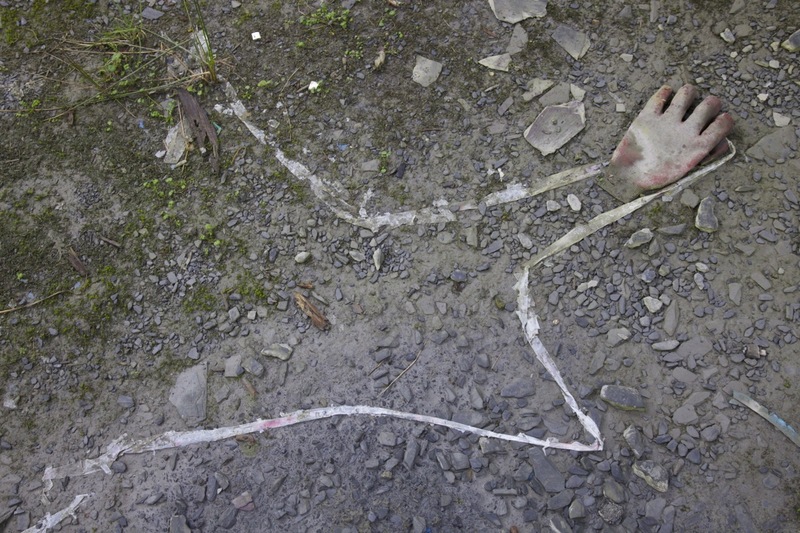 Thanks so much – yes, it was strange, because I had no inkling what this site would be like. Excellent photographs, Paul — both eerie and evocative. And yes, the atmosphere of Stalker resonates here. Thank-you Laurence. I am particularly enjoying your Central Asia posts at the moment. 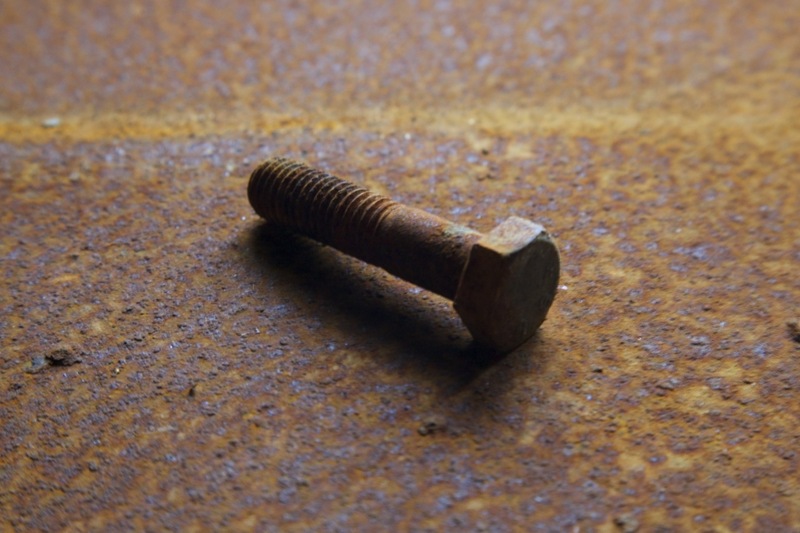 Thanks Alex – that blog is great, especially the photographs!